There’s always a project going on at the kompound. I think of our home as a work in progress. I can’t remember if I’ve ever sat back and thought – we’re done, there’s no more to do. Winter we project inside; summer we head outdoors and put our skills to work. Our yard is a haven, much like a park or retreat. I never really feel the desire to get away in the summer….why would I? It’s beautiful here. This year we’ve taken on a big project, not one we intended, but last year’s led us to this year’s, without much consideration for doubt. We redid our deck last year (tip – don’t remove one rotting board if you suspect there’s more, because there is! ), everything was rotten under the boards, and when we rebuilt it we removed part. 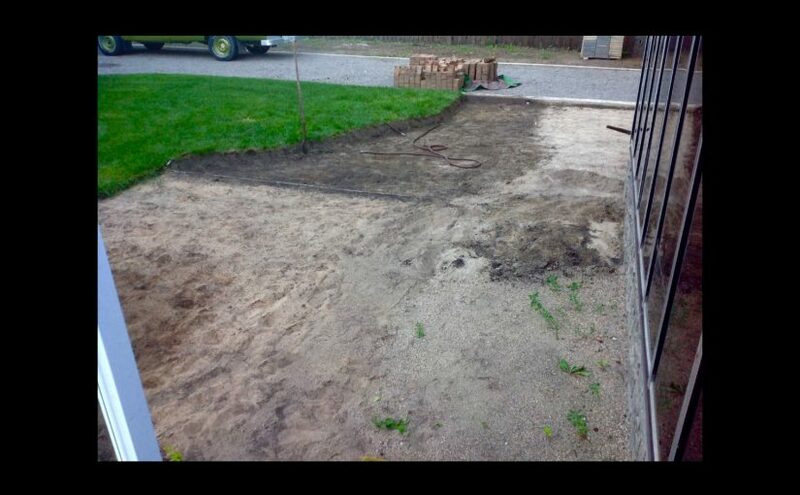 This threw our east and north patios off, they didn’t line up and we had a big gap of dirt in between them. So, our project becomes redo the patios. We (ok, I) decided to make one big glorious patio, with a wall and corners and lights….poor Jimmy’s eyes were rolling when I explained it. But he trusts my ideas and works with me to see them become reality. Soon we’ll be laying new paving stones and shopping for new furniture! I have the whole vision in my head, exactly the way I want it to look and I am excited. 2016’s summer project was Jim’s; I sat and watched. 2017’s project I am in it all the way….shovel, gloves, dirt, sweat, bruises, sore muscles, smiles and excitement!